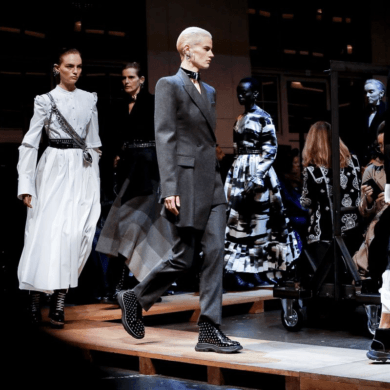 It happens every year – fashion weeks come and go in a flash – and we’re left with our heads swirling thinking about all the amazing things we can’t wait to see next season. 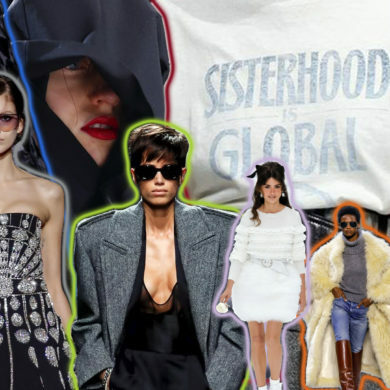 London Fashion Week came to a close last night, and while the fashionable crowd in London partied it up at Le Baron, we took some time to roundup our favorite looks from the fabulous designers across the pond. What were your favorite looks from London? Tell us in the comments below! 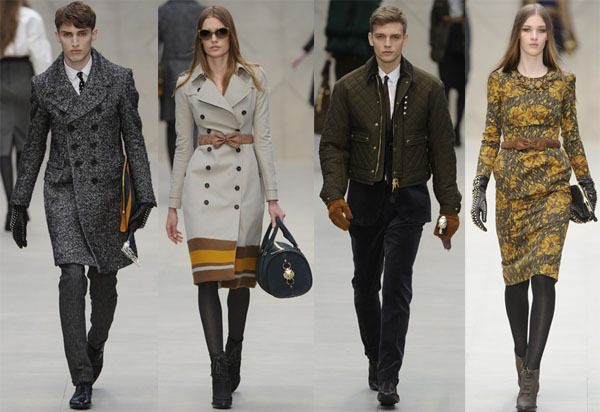 This season, Christopher Bailey turned out more of what we know and love from Burberry – terrific outerwear with a twist. The collection was grounded in an earthy pallette of khakis, yellows, and browns, and we loved the floral prints. We were particularly taken with the men’s wear, classic cuts with a downtown edge, particularly in the accessories department. Studded gloves? Yes. 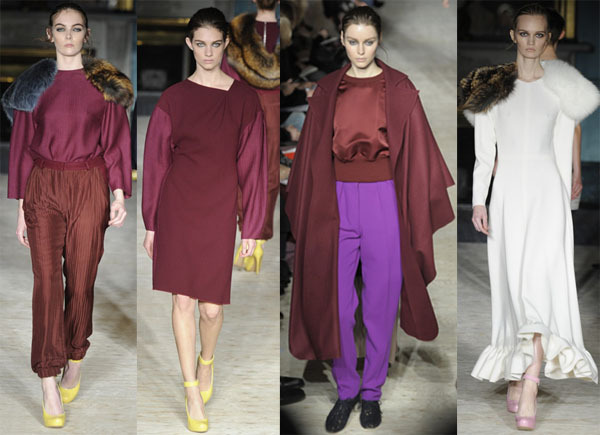 Roksanda Illincic has made sure that color-blocking will stick around – at least for Fall 2012. Her collection came in a variety of shades of cranberry, claret, and dahlia, punctuated with bright yellow shoes. Even the fur partook in the color-blocking party, which we thoroughly enjoyed. The lighter looks that closed the collection were particularly striking – we always love a good winter white. 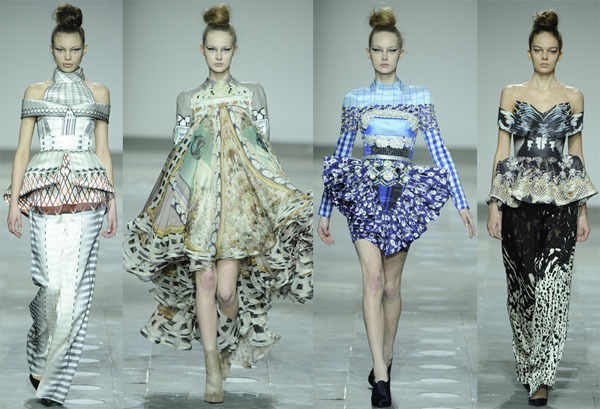 We have developed a bit of an obsession with Mary Katrantzou, thanks to her gorgeous prints, and this season did not disappoint! She showed a mix of prints in a softer pallette than previous collections – beautiful desert hues, sea foam greens and periwinkle blues – that gradually faded to black. And though we love the prints, we were really impressed with the silhouettes this season. Peplums, pleating, and structured ruffles gave the collection an air of refinement – in a subversive way – the perfect mix of uptown and downtown. 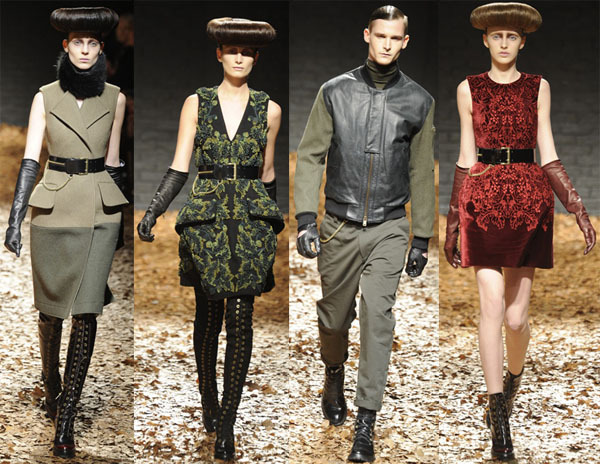 The McQ Fall ’12 show caused quite a stir – bringing theatricality back to the runway as only McQueen can do. Sarah Burton hit many of the signature McQueen motifs – dark romanticism, military accents, expert tailoring – culminating in a collection that reflected the aesthetic and values of the original line, while still remaining accessible and wearable. 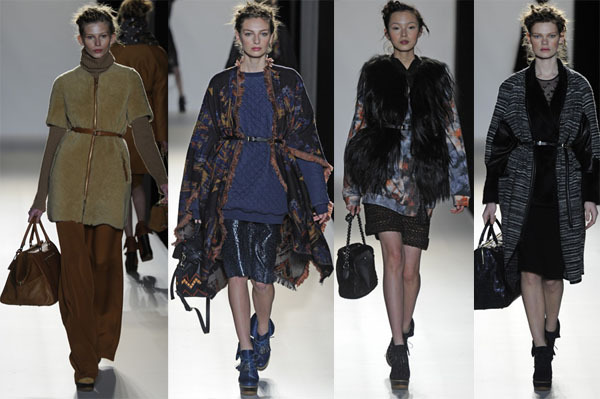 For Fall ’12, Mulberry, sent out a deliciously seasonal collection of autumnal separates in tweeds, knits, and lots of fur. The lesson in layering included shearling coats, tapestry print shawls, and Mongolian fur vests, layered over sequin skirts, palazzo pants, and slouchy shorts – all anchored with cinched waists. AND – they named their new bag after the beautiful songstress/muse Lana Del Rey. She may be controversial, but we love her.